The frequency of suicide, self-injury, and violence in school settings requires preventative and response policies and procedures for the safety and protection of faculty and students. 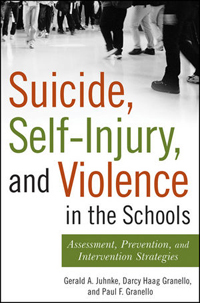 Suicide, Self-Injury, and Violence in the Schools: Assessment, Prevention, and Intervention Strategies provides first responders—specifically school counselors, psychologists, social workers, teachers, and administrators—with information on assessing risk. In addition, guidelines are included on how to respond to these crises in a practical and proactive manner that minimizes risk and/or impact on the school community. • discussion on psychological first aid in response to school violence survivors and their parents. Filled with mini-case vignettes, as well as checklists for school personnel to use, this reference supports school professionals in devising the very best prevention, intervention, and postcrisis strategies. It is a good resource for establishing a collaborative, nonsuicidal, nonviolent environment both within and outside the school setting.